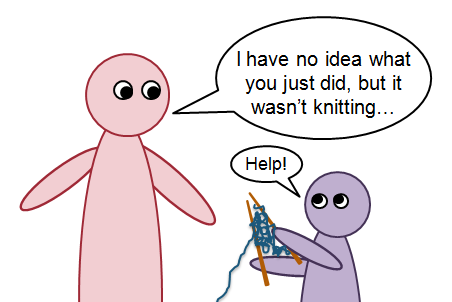 I was recently asked by an acquaintance if I would teach her 7-year-old daughter how to knit as part of her homeschooling program. Eager to become friends with the mom, I readily volunteered. Given that I was taught to knit for free by a coworker, I'm always happy to pass on her act of kindness whenever possible. Little did I know the unique challenges that come along with teaching kids how to knit! 1) Bring all the supplies yourself. Do you know how complicated buying yarn and knitting accessories can be for a newbie? I remember sweating bullets the first time I went into the yarn section of Michael's, even with the detailed shopping list from my teacher. I think it's just easier to lend a pair of US size 6 to 8 needles and a ball of light-colored scrap yarn, or purchase the supplies on their behalf. In fact, the little girl is learning on the same pair of needles I used for my first lessons: 9-inch-long, bamboo, single-pointed knitting needles from Clover. The wooden needles are comfortable to hold, they're not as slippery, and they have dull points. 2) Have a lesson plan. 3) Encourage a family member to learn knitting with the child at the same time. There's no way a kid will remember what is taught unless he or she reviews between lessons. It's ideal if the child's guardian or older family member can also learn at the same time and then help the child practice at home. If the family member needs a refresher, I point them to the incredibly helpful videos at knittinghelp.com. 4) Keep each learning session short and free of distraction. Kids have short attention spans, so I found that 30 to 60 minutes is probably the maximum they'll last. Plus, we held lessons at a Starbucks because at home, there are distracting toys, other kids, and pets around. 5) Have a "final project" in mind. There's nothing like giving students hope that one day they'll be able to make something cool and not just a simple swatch of uselessness. :) And you don't have to just do the age-old standard scarf or dishcloth. Consider a fun and short pattern, like a hat, small bag, or fingerless mitts. The minimum age for teaching knitting seems to be six or seven years old, due to dexterity limitations. Specifically, we had some trouble with the purl stitch since I taught her Continental knitting (which is commonly considered one of the faster styles). Imagine my surprise and delight when she came back the next week and showed me this great technique of using her left pointer finger to "catch the sheep," or fetch the yarn through the loop. I was so proud of her, I took a video! How old were you when you learned to knit, who taught you, and what method of knitting do you prefer? Loving your blog! I'm up in the wee hours with my little one. She finally fell asleep, and I can't stop reading your posts! Your life mirrors mine so much! Can't believe there are so many other gamers' wives out there! Oh my gosh. I am an avid crocheter but cannot knit to save my life. I have trying for decades but cannot "get it". I would love to knit.